To Cite: Assarzadegan F, Tabesh H, Hosseini-Zijoud S, Beale A D, Shoghli A, et al. Comparing Zonisamide With Sodium Valproate in the Management of Migraine Headaches: Double-Blind Randomized Clinical Trial of Efficacy and Safety, Iran Red Crescent Med J. 2016 ; 18(9):e23768. doi: 10.5812/ircmj.23768. Background: Migraine is one of the most debilitating medical conditions and has a high socioeconomic burden. As conventional therapeutic methods do not entirely alleviate the symptoms, new alternatives are being considered. Objectives: This study evaluates the efficacy and safety of zonisamide compared with sodium valproate in the management of migraine headaches. Patients and Methods: In the current double-blind, parallel, randomized, controlled trial, 96 patients with a migraine diagnosis based on the international headache society (HIS) criteria were selected. They were divided randomly into two groups; the case group was given zonisamide, and sodium valproate was given to a control group. In addition to the side effects of the drugs, the severity, duration, and frequency of migraine attacks were evaluated at baseline and at three months. Results: The 96 selected patients were divided randomly into two treatment groups (zonisamide n = 48, sodium valproate n = 48). Seven patients were excluded from analysis because of early dropout, leaving 89 (n = 45; n = 44) patients for analysis. While using zonisamide, six (13%) patients complained of fatigue, and two (4%) patients encountered noticeable appetite and weight loss. In the control group, five (11%) patients reported dizziness, and four (9%) patients faced obvious appetite and weight gain. Both drugs were considerably efficient in reducing further attacks. There was no statistically significant correlation between frequency or severity of migraine attacks and the drug used for treatment in three months of follow-up. Conclusions: Both medications are effective in reducing migraine attacks. It will be important to consider the drugs’ adverse effects and availability and patients’ medical and socioeconomic condition to select the appropriate treatment. According to the world health organization (WHO), headache is the most common debilitating medical condition that people around the world experience. Migraine is the most common type of vascular headaches and affects about 18% of women and 6.5% of men worldwide. More than 90% of patients suffering from migraine mention inability to work during attacks; 53% need complete rest due to severe disability; and approximately 31% will miss at least one day of work or school every three months. Age distribution of migraine is higher among active members of the society, with approximately 90% experiencing their first attack before age of 40 (1, 2). In addition to the high prevalence of migraine, as mentioned above, the chronic nature of headaches, drug costs, and recurrent treatments have negative social and economic impacts. As a result, effective prophylaxis of migraine has been a constant fundamental concern in neurology prior to cure which can reduce the frequency of headaches by 50% (3). Since any of the numerous and current medicinal (such as tricyclic antidepressants, beta blockers, and anticonvulsants) and non-medicinal prophylactic therapeutic modalities are not entirely alleviative, novel drugs currently are being tested. A more effective, tolerable, and safer prophylaxis for migraine is highly sought after (4). Zonisamide is a new generation sulfonamide anticonvulsant that was introduced in 1972. It has several mechanisms of action, including blocking the repetitive firing of voltage-sensitive sodium channels; reducing voltage-sensitive T-type calcium receptors without affecting L-type calcium receptors; modulating gamma-amino butyric acid analogs (GABA) ergic and glutamatergic neurotransmission; and as a weak carbonic anhydrase inhibitor (5). This medication is a derivative of the topiramate family, an effective anticonvulsant extensively used for prophylaxis of migraine headaches. Zonisamide treatment’s biphasic effects on dopaminergic systems and blocking of T-type calcium channels (6-8) result in better headache relief. However, side effects of zonisamide consist of weight loss, restless legs syndrome (RLS), paresthesia, renal stones, and agitation, though these are less than other anticonvulsant treatments (7). The longer half-life of this medication is appropriate for a once-daily dose, helping patients have higher compliance. The current study compared the efficacy and safety of zonisamide in the management of migraine with sodium valproate, the choice treatment in these types of headaches. This was a double-blind, controlled, parallel-group study conducted in Iran. All patients of 18-65 years old who came to the neurology clinic in Imam Hossein hospital in the period from January 2010 to February 2012 complaining of headaches were selected. Imam Hossein hospital was established in 1986 and is considered as a referral center in Tehran, Iran. It is a 570-bed educational and general medical-surgical hospital and currently has wards of neurology, neurosurgery, general surgery, internal medicine, pediatrics, gynecology and obstetrics, infectious disease, ophthalmology, orthopedics, oncology, radiology, emergency, psychiatric, dialysis, and pathology, as well as ICU, NICU, CCU, operation room, clinics, and clinical laboratory. Voluntary patients were selected according to the diagnosis of migraine based on the international headache society (HIS) criteria (9) and who have had more than four moderate to severe migraine attacks in a month. History of consuming sodium valproate or zonisamide, taking any migraine medicinal treatment in the last month, history of renal stones, being allergic to sulfonamides, and abusing alcohol excluded patients from the study. Ninety-six patients qualified for this randomized clinical trial. The 96 patients were randomly assigned to two parallel groups, initially in a 1: 1 ratio, to receive zonisamide (50 - 150 mg) in the treatment group and sodium valproate (200 - 600 mg) in the control group. The unit of randomization in this study was each enrolled patient. To ensure balance between treatment groups, randomization was performed using a random number table and permutated blocks of four. The randomization schedule was generated by a member of the researchers’ office staff who had no other involvement in the study. The schedule was then delivered to the pharmacy in a sealed envelope and kept there for the remainder of the trial. The schedule was executed by the pharmacy staff as each patient was enrolled. The pharmacist had no direct communication with the physician or nurse enrolling the patient, and blinding appeared to be entirely successful. The zonisamide and sodium valproate were in tablet form and identical in appearance. In a three-month follow-up period, the frequency (number of headaches per month), duration, and severity of headache attacks were measured and calculated. Improvement of these variables translated into success of treatment. Duration of headaches was categorized as headaches that last for 4 - 24 hours (1 day), 24 - 48 hours (2 days), and 48 - 72 hours (3 days). We also recorded a quantitative variable for severity of headache attacks based upon a qualitative variable using the visual analog scale (VAS). In this scoring system, mild, moderate, and severe headaches are scored 0 - 3, 4 - 6, and 7 - 10, respectively. All patients signed a written informed consent before entering the study. Additional information was provided in the event that the participant became distressed in any way during participation. Participants were free to withdraw their participation at any time without negatively impacting their involvement in future services or the current program and relationships with any of the researchers or research bodies involved. Confidentiality ensured such identifying information was excluded from any reports or published documents. This project was approved by the institutional ethics committee of Shahid Behehsti University of Medical Sciences (SBMU). All statistical analyses were performed with SPSS software (version 11.5; SPSS Inc., Chicago, IL). Mean ± SD values were calculated for continuous data, while frequencies and percentages were calculated for categorical data. The comparability of the characteristics between the two study groups was assessed using a two-sample Student’s t test for continuous variables and the Wilcoxon test, when appropriate, for categorical variables. P < 0.05 was considered statistically significant. The eligible patients were recruited from January 2010 to February 2012. In the present study, 48 out of 96 patients were treated with zonisamide, and the other 48 patients were treated with sodium valproate. 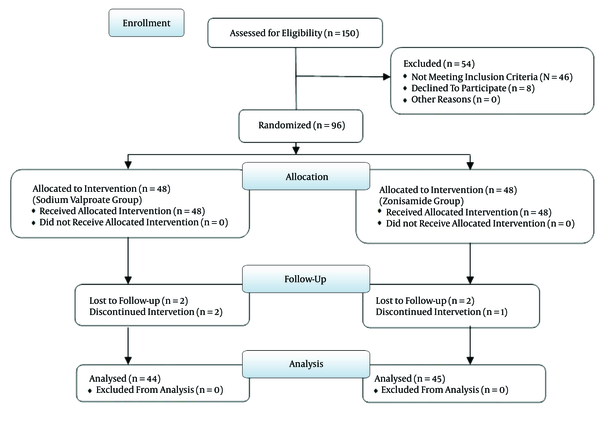 Seven patients were lost to follow-up; four of them did not return to the clinic for follow-up, and the other three patients refused to continue allowing their data to be used in the project (Figure 1). Consequently, the final results consist of 44 patients treated with sodium valproate and 45 patients with zonisamide. 33 (37%) patients were male and the rest (63%) were female. The mean age of all patients was 30.96 years (range of 18-58 years) with a standard deviation of 9.44; the average age was 29.76 for patients who took zonisamide and 32.18 in the control group. The age difference between these two groups of patients was not statistically significant. Twenty-six (29.2%) patients suffered from migraine with aura, and 63 (70.3%) had migraine without aura. Patients’ demographic characteristics are shown in Table 1. Patients took 50 mg of zonisamide as the initial dosage, and maximum dosage was 150 mg. These dosages were 200 mg and 600 mg for sodium valproate, respectively. A total of 23.59% of patients experienced side effects, of which 10.11% were the patients treated with zonisamide. The most common side effect in these patients was fatigue, and dizziness was the most common side effect in the control group (Table 2). aData are expressed as or N. (%). At the start of treatment, the frequency, duration, and severity of headache attacks were measured and calculated. These variables were not significantly different between the two groups (Table 3). Both drugs reduced migraine attacks in three months of follow-up, although there was no statistically significant correlation between frequency or severity of migraine attacks and the medication used for treatment (P > 0.05). Similarly, there was no significant difference in terms of days of disability due to headaches between these two groups (P > 0.05) (Table 3). With the high prevalence of migraine, a debilitative disorder, and its socioeconomic burden (9-11), having access to multiple therapeutic methods and medication seems vital. This study evaluated the efficacy and adverse effects of zonisamide in migraine in comparison to sodium valproate, the conventional treatment. As in some previous studies, it was demonstrated that zonisamide can be efficient in reducing migraine attacks (6, 8, 12, 13). The results of these investigations are consistent with the current study, in which diminished severity, duration, and frequency of further attacks after treatment with zonisamide were observed, and it was concluded that these effects were not significantly different when compared to the case group (Table 3). Selecting a reasonable and appropriate treatment for migraine headaches is influenced highly by the drugs’ side effects. Some significant adverse effects of sodium valproate and zonisamide. For sodium valproate, thrombocytopenia, increased bleeding time, weight gain, tremor, central nervous system (CNS) depression, hepatic failure, and acute pancreatitis were noted. The two latter make it vitally important to monitor closely laboratory data and symptoms of hepatic failure and pancreatitis in patients (14, 15). For zonisamide, somnolence, anorexia, weight loss, dizziness, and renal calculus were noted as adverse effects. It is recommended not to use this medication in patients with renal impairment and also to use with caution in hepatic failure (16-19). The side effects observed in this study are summarized in Table 2. Six patients (13%) complained of fatigue while using zonisamide, and two cases (4%) encountered noticeable appetite and weight loss. Five cases (11%) reported dizziness, and four patients (9%) faced obvious appetite and weight gain in the other group. Considering these details can aid in a more precise decision based on each patient’s specific conditions. For example, zonisamide is a better choice for overweight patients and safer than sodium valproate in patients prone to hepatic failure. On the other hand, for patients with history of renal impairment, renal stones, or high levels of creatinine or blood urea nitrogen (BUN), zonisamide should not be prescribed (20, 21). Although the prevalence of these side effects are low (as shown in this study), harmful complications such as hepatic failure, pancreatitis, and renal impairment should be considered seriously before prescription. The main limitations of the present study were the low total number of patients and it being a hospital-based study. The researchers recommend further multicenter investigations with an extended follow-up period. The results of this study suggest that zonisamide, like sodium valproate, could be an effective agent for treatment and prevention of migraine. These drugs have an obvious effect on reducing severity, duration, and frequency of migraine attacks. The drugs’ side effects and availability and patients’ medical and socioeconomic condition are key factors for selecting the most appropriate treatment. The authors of this manuscript thank all participants that cooperated in this project; your dedication is deeply appreciated. We are very grateful to Ali Faramarzi-Gohar of Biostatistics for supporting us with statistical analysis. This project was supported financially by a grant from the clinical research development unit, Imam Hossein hospital, Shahid Beheshti University of Medical Sciences, Tehran, Iran. Authors’ Contribution: Study concept and design: Farhad Assarzadegan, Hanif Tabesh; acquisition of data: Hanif Tabesh, Seyed-Mostafa Hosseini-Zijoud, Arya Shoghli, Mahmood Ghafoori Yazdi, Behnam Mansouri, Omid Hesami, Nahid Beladi Moghadam and Hosein Delavar Kasmaei; analysis and interpretation of data: Farhad Assarzadegan, Hanif Tabesh, Andrew David Beale, Behnam Mansouri, Omid Hesami, Nahid Beladi Moghadam and Hosein Delavar Kasmaei; drafting of the manuscript: Farhad Assarzadegan, Hanif Tabesh, Seyed-Mostafa Hosseini-Zijoud and Andrew David Beale; critical revision of the manuscript for important intellectual content: Farhad Assarzadegan, Hanif Tabesh, Seyed-Mostafa Hosseini-Zijoud, Arya Shoghli, Mahmood Ghafoori Yazdi, Behnam Mansouri, Omid Hesami and Nahid Beladi Moghadam; statistical analysis: Farhad Assarzadegan, Hanif Tabesh, Seyed-Mostafa Hosseini-Zijoud and Andrew David Beale; administrative, technical, and material support: Farhad Assarzadegan, Hanif Tabesh, Arya Shoghli, Mahmood Ghafoori Yazdi, Behnam Mansouri, Omid Hesami, Nahid Beladi Moghadam and Hosein Delavar Kasmaei; study supervision: Farhad Assarzadegan and Hanif Tabesh. Funding/Support: This project was supported financially by a grant from the clinical research development unit, Imam-Hossein hospital, Shahid Beheshti University of Medical Sciences, Tehran, Iran.